When I purchased my country property several years back it was in dire need of updating. Over the last few years, I have gradually replaced many items which were hanging on at their end of life! The conventional, tank water heater was approximately 15 years old and while it worked, it took between 5 to 7 minutes to get hot water to the master bathroom, depending on outside temperature. I knew it needed to be replaced so I began researching tankless water heaters. I have no connection to any brand mentioned other than being a happy customer. I had already decided to use propane gas as a fuel source as I did not want electric and I don’t have access to natural gas. This article describes my research and choice of a water heater. I lived in Europe for five years and most of the housing had tankless water heaters so I gained some valuable experience with on-demand water heaters; both good and bad. Fast forward a bunch of years and the on-demand heaters were becoming the rage in the USA because of the high utility costs of conventional tank water heaters. But I stayed with my 50-gallon tank and paid the price of heating water 24/7/365. About 8 years ago I was faced with replacing water heaters in a large house. I had a choice to replace three 50 gallon tank heaters with newer models or go tankless. About that time a friend of mine had her 50-gallon tank water heater, located in her attic, fail and the water damage was significant. She had to move out of her house for six weeks while ceilings, floors, carpet, drywall, etc., were replaced. Her experience was a motivator for me! I did my due diligence and researched all types of water heaters; both tank and tankless. The tank type was much cheaper to purchase and install but the utility bill is what made the difference. The tankless heaters had higher upfront costs but saved on the utility bill the rest of its useful life. After going back and forth for months, I made the decision to go tankless. While the research you must do is the same for any type of tankless water heater, your family lifestyle, location, how long you think you will stay in the house, the availability of desired fuel, and maybe Home Owner Association (HOA) rules will influence your decisions. I also considered the improved resale value of the home by having energy efficient tankless water heaters. So what’s the difference? Basically, the tank heaters hold the water at a constant temperature 24/7/365. When you turn on your hot water faucet the hot water in the tank mixes with cold water from the house water system and gives you warm water. You pay your utility provider a fee to keep that water hot all the time. In a tankless system, the water heats only at your demand. When you turn the hot faucet on, the heat exchanger in the tankless unit turns on and provides you hot water, then stops heating water when you turn the faucet off. Below is a diagram I copied from the Navien website on the components of a tankless water heater. One of the first decisions you have to make is the type of fuel for the water heater; the choices are electric, natural gas (NG) and propane gas (PG). If your house is all electric that may influence a decision to install an electric heater, but there is always the possibility of running NG to your house if you are close to an existing line. Some city/communities/HOA will not allow a propane tank in the yard, but you must ask the HOA and city ordinance folks. They might allow a buried underground tank, but not an above ground tank. Do a cost comparison of fuel types (if all are available to you); the cost of electric, NG or PG. This is the measure of how much water passes through the water heater at a time, in gallons per minute (GPM). For NG/PG tankless water heaters, it averages between about 6 GPM and 10 GPM but some go higher. I was told an average shower or faucet has about 2 GPM flow rate; so you can get an idea of how much water flow you use. If you have two adults, two teenagers and 2 younger children, think about the number of water fixtures that will be used simultaneously and how long the water will run if you have teenagers in the bathroom. Will you have people in the shower at the same time you are running the washing machine and your dishwasher? If your family is two adults and some fur babies, your demand will be different. The important point is not to confuse the flow rate value with the water heater’s heating capacity. Water flow capacity is NOT how hot the water will be if it’s flowing at 10 GPM. For example, a tankless water heater listed as providing 10 GPM will give you water at that rate, BUT how hot that water can rise to depends on the energy input of the unit. That is why when choosing a NG or PG tankless water heater you need to pay attention to its energy input per hour, or BTUs per hour. Now here’s where the info gets more complicated. There is a whole complex discussion of British Thermal Unit (BTU), joules and temperature explained on many different websites on the internet. I am not an expert on this so I just used the common knowledge I read on several internet sites. Basically, about 500 BTU/hr is enough to heat water flowing at 1 GPM by 1 °F. If you know what the incoming water temperature is, it is possible to estimate how many BTUs per hour you need from a tankless water heater. You can ask your plumber to figure this out for you. Water temperatures can vary by season and by location; e.g., New York is colder than Mississippi in the winter so the groundwater temperatures will be different. 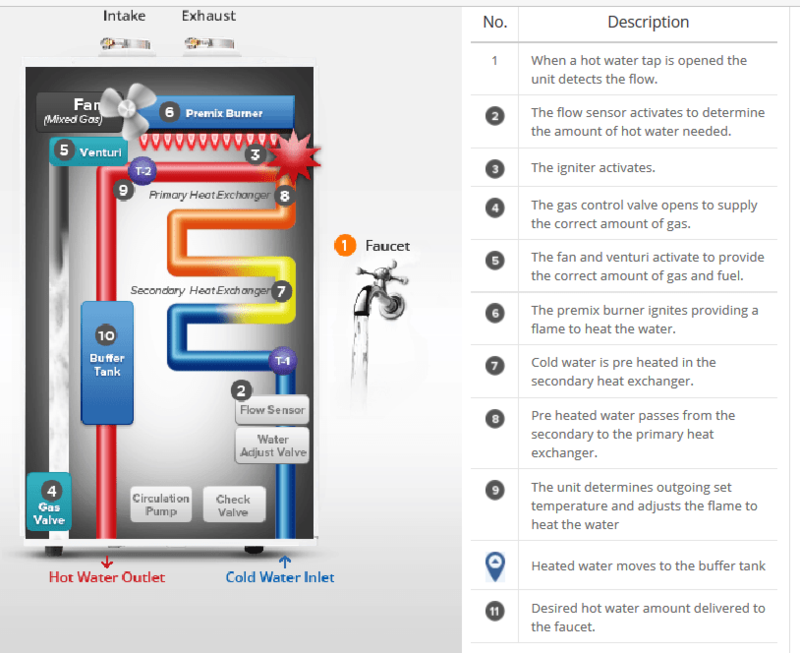 o calculate how many BTUs are actually used to heat the water, you need to use the energy factor. The energy factor for water heaters means the part of the heat energy actually applied to the water and to the total energy input which is delivered to the heater. I wanted an energy factor of at least .9.5. If you have a four-person family, you will need at least 160,000 BTU, higher would be better. The energy factor needs to be about .9. For natural gas and propane tankless water heaters, the energy factor varies between 0.8 and 0.95, depending on whether it is a condensing unit or not. So what is the difference between condensing or non-condensing water heaters? Simply put, a condensing water heater uses the heat of the expanded gas, which would normally be expelled through a vent, as an additional heat source. The waste gas released from the exhaust vent of a condensing water heater is cooler and in the cooling process, the water vapor often condenses back to the liquid state, which is why it is called a condensing water heater. Non-condensing tankless gas water heaters have an average energy factor of 0.82; condensing water heaters have an energy factor of up to 0.95. Guess what? Condensing units cost more money, but I think they are worth it. One of the things you need to realize is tankless water heaters only start heating when their sensors confirm a certain amount of water is flowing through the system. If the water use does not reach that minimum flow rate, the unit will not be activated and you get cold water. This means if you don’t turn the faucet on full open, the water heater may not turn its heating element on. Look for a water heater that has a .4 to .6 flow rate. You do NOT want a 1 GPM flow rate. Do your homework and check out the product specification sheets and make sure you get a unit with a LOW number minimum activation rate. I am very opinionated on this topic so bear with me. I like hot water; that is why I purchased tankless hot water heaters. In a former house, I had a whirlpool tub that I could not use because the tank water heaters could not provide enough hot water. After I installed the tankless water heater, I was able to fill the big whirlpool tub and enjoy the experience with HOT WATER. Sorry, I digressed. The old saying “you get what you pay for” is true and especially with tankless water heaters. I won’t demean various brands, but I say, do your homework. If you are on city water your brand choices are wide. Talk to people and quiz your plumber and friends on their opinions of different brands. Tankless water heaters can be indoor or outdoor, vented or non-vented; depends on what you want/need. Outdoor units should have ALL pipes insulated; some indoor units should also be insulated, depends where you have it installed. I have had both indoor and outdoor units insulted, even though I live in the South. Northern folks MUST have insulation! Tankless water heaters require a minimum of ¾” pipes while conventional tank water heaters only have ½” pipes; this should be included in your install price; everything is negotiable. Water heaters need some annual maintenance so put them where you can get to them. It will take a minute for the hot water to get to your faucet, depending on where you place your water heater. I had to wait 6-7 minutes for my conventional tank electric water heater to get hot water to my master bath shower. Now with the new tankless one, it takes 1-2 minutes to get to my shower. Before you turn on your dishwasher, turn your kitchen faucet hot water full open and let it get hot; then start your dishwasher. It will take a few seconds for the tankless water heater to adjust temperatures from hot to warm or warm to hot. Depending on the type of faucet you have, once you get used to the tankless water heater, you’ll know where to turn the faucet the first time to get the temperature you want. If you live in the country and are on well water your choices are more limited. Unless filtered at the entry point, most well water contains a lot of minerals and will corrode any water heater. Navien brand water heaters have stainless steel innards and will hold up better when connected to well water. Other brand heaters are less expensive; but they usually have cooper innards, which corrode more quickly. At my place, the well pumps water to an underground holding tank. Occasionally, there is low water pressure between when the well pump kicks on and the pressure pushes the water to the faucets. This causes a lower flow rate to my faucets, which delays the water heater kicking on. To me, this is just part of having well water so it does not cause me any concern; I just patiently wait until the well pump does its thing. But it is something you should be aware of if you are on well water. Because I live in the country, have a set income and I really like hot water, I decided to purchase and install a propane tankless water heater. It is an outdoor condensing unit. I choose Navien (click here to check price and availability on Amazon.com) because I use well water and Navien is the only brand (that I researched) which has stainless steel innards. The picture below is of the installed tankless water heater on the exterior of my house. This is the largest residential unit Navien makes and the insulation is protected by the unit cover. Other brands will work but they will corrode faster from well water. With Navien’s 15-year heat exchanger warranty, the water heater may outlast me. I am not affiliated with Navian, I am just a happy customer. I have purchased three Navien tankless hot water heaters for various houses and I have had no problems with them providing hot water when I wanted it. That said, Navien requires a licensed plumber to install the unit to receive their 15-year warranty. A good DIYer could probably install the unit, but again, Navien will not warrant it unless installed by a licensed plumber. The only thing I am unhappy about is I cannot independently light the water heater because it has a closed, self-contained ignition. That means I cannot take a match to a pilot flame like we could in the old days. But, I have a propane generator so unless manufacturers stop making propane, I’m good! Tankless water heaters will cost you more up front; there is no getting around that. But…your utility bill will go down. In my former city house, the three conventional tank water heaters were NG. After the Navien tankless NG heater was installed my gas bill reduced by 45% the first full month and after a year the bill was down by 52%. Currently, my conventional electric 50-gallon water heater cost about $700/year to operate. Since I have only had this tankless water heater a short while I don’t have statistics to give you; but I anticipate about 4.5-year return on investment (ROI) for the tankless water heater. The cost will vary around the nation; your location makes a big difference in the price. Your cost reduction and ROI will be different depending on the brand, size of tankless water heater you choose and your family size and use. You can see most of the retail prices on the internet but remember, your plumber can get a discount. Installation charges could vary from $800 to $2000, depending on your location, codes and ordinances, how much ¾” piping is used and your plumber’s profit margin. One last plus for tankless water heaters: In 2016 the IRS is allowing a $300 tax credit for installation of energy efficient tankless water heaters. I’m sure there are some really knowledgeable readers that can talk technical specs better than I can, so please pitch in and clarify if you can. My need was to have hot water and my desire was to save money so I decided to switch to a propane tankless water heater. I cannot put a price on my peace of mind. I hope this information is helpful. I enjoyed this article, and learned a lot. Good factual information, in a good writing style. Very good article. You touched on all the major points. We have a tankless water plus we have pex tubing running in loops in the concrete floor for our new wing of the house. Originally from Florida, I love to walk barefoot and having warm floors throughout the winters in the mountains of NC. You rightly mentioned minerals in the water, as I understand it, hard water will cause lime deposits in the metal pipe, causing a build up on the inside, reducing the water flow rate or causing pin hole water leaks in the heat exchanger, shortening the life of the system. It is best to have a water softener between your well and your heater. Excellent article, very well written. In the early days of instantaneous water heaters, I called around to see who supplied them. My gas company that supplied propane in our rural area had one unit left. The rep said,” I will sell it to you but I don’t recommend it.” He said, “they plug up and fail, you will not like this thing.” As you mentioned in the article, the units do need some maintenance and will be negatively affected by hard water. The only advise anyone offered, “be sure to install it with unions so you can take it out to flush out the deposits.” While I agree on unions for any install like this as a good practice, I think the technology has really matured. I see a few of the units in upscale homes here in the Philippines. I have, in six years here, seen exactly one tank type water heater in residential use. Tank type units are few and far between here, only used in commercial settings. Once again, a super article. A relatively good artical for those not well informed. Larger BTU units could be more costly and less efficient if a smaller unit works for the need of the home. Bigger is not always better. Water heating is sized for the home. Not all tanks have 1/2 in piping. Why would you want a pilot light? With the newer efficient unit, it would be a waste of product and cost more money in wasted fuel. Sealed combustion is a safety feature in as if the unit won’t work properly, it will shut down. Think carbon monoxide if an inside unit. For those with long wait times for hot water to reach a faucet, a recirculating hot water loop would reduce waste, giving almost instant hot water to a faucet. All depends on the home. If your on demand was located at the same spot as your old tank, would the 5 to 7 minutes wait time be the same? Water will not flow any faster under the same pressure. I have been using a Metlund D’Mand circulating pump for more than 10 years without any trouble. I have the wireless switches and receiver which have also preformed flawlessly (knock on wood). The pump only operates when activated via the wireless system, or by a hardwired connection, and cuts off when the max water temp is reached. I also insulated my water lines to conserve energy. This type of pump will save tons of water, while providing hot water to your fixtures very quickly. After doing some online research I discovered a tank-less propane water heater would save me $15 a year. Yes, a year, not a month. The installed cost would be over $1000 more than an electric, no real savings there. However a hybrid electric heater (it has a little heat pump on top) could cut the bill by 75%, one reviewer said his uses one kilowatt hour a day. With an installed cost a bit less than a tank-less payback time would be less than five years. We had a electric tankless water heater installed in our daughter’s home. It works fine, reduces electrical costs, and is more than sufficient for a family of six.